Work with clients on real-world social impact projects in research, consulting, and strategy. Join students committed to developing the skills to become the social impact leaders of tomorrow. Learn about faculty research on the first-ever academic study of impact investing contracts. Receive a generous financial award as a recent alum working in social impact. Tune in to the weekly SiriusXM radio show to hear insights from social impact industry leaders. Take a course on business and social impact, even if you’re not a student at Penn. What makes a company a good employer for women? 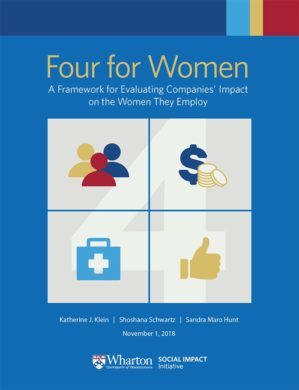 Based on a synthesis of hundreds of academic studies of women in the workplace, our latest report, “Four for Women: A Framework for Evaluating Companies’ Impact on the Women They Employ” identifies the outcomes that matter most for women. Become a social impact leader of tomorrow.